Celebrities can sell anything from cars to clothing, and we are constantly fascinated by their influence over our lifestyle choices. 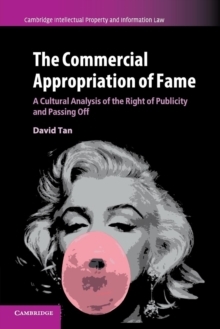 This book makes an important contribution to legal scholarship about the laws governing the commercial appropriation of fame. Exploring the right of publicity in the US and the passing off action in the UK and Australia, David Tan demonstrates how an appreciation of the production, circulation and consumption of fame can be incorporated into a pragmatic framework to further the understanding of the laws protecting the commercial value of the celebrity personality. Using contemporary examples such as social media and appropriation art, Tan shows how present challenges for the law may be addressed using this cultural framework. This book will be of interest to intellectual property law academics, judges, practitioners and students in the US and common law jurisdictions, as well as those in the field of cultural studies.